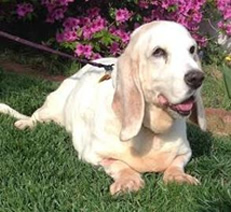 Like a fine wine, basset hounds improve with age. If your ideal dog is calm, house-trained, tolerant, non-destructive, and wise, consider sharing your life with one of our vintage bassets. Our older dogs have come to us through often tragic circumstances. 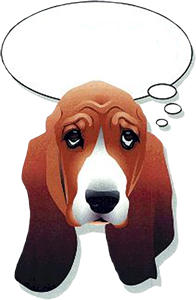 Perhaps a beloved owner has passed away, or perhaps the basset has been abused or abandoned by the family he trusted. He feels confused, sad, and lonely. He doesn't understand why no one loves him. It is heart-breaking to see a healthy, loving, and gentle dog passed over again and again, while younger dogs trot happily off to meet their new families. Our vintage bassets deserve a forever home just as much. They long for a home where they can live peacefully, snooze in the sun, go for leisurely walks, and sit quietly by your side. They ask for so little, and they have so much to give. Let them know that you have a heart as tender as theirs. Check out our Available Dogs and consider adopting an older dog today.